Because healthcare represents about 20% of the economy, this legislation will doom the country to economic stagnation, bankruptcy and ill health. incentives/disincentives perceived by the individual. In this sense, each individual is an “economic actor,” whether engaged in monetary transactions or not. Human beings react to choices afforded them in a manner that improves their condition (or pains them the least). To understand the likely effects of ObamaCare, it must be looked at from a bottom-up rather than a top-down perspective. What has the legislation done in terms of the incentives available to economic actors? Washington tends to view everything in terms of the “big picture.” This view is top-down. They visualize what they want to happen and confuse it with what will happen. Wishful thinking and good-intentions do not necessarily produce good results. In Washington-speak, “good intentions” and “unintended consequences” are euphemisms that describe failed programs. To understand why ObamaCare will fail and do so disastrously, one must look at the program from the bottom-up. What are the incentives/disincentives that will be imposed upon the various users/providers in the healthcare industry? Do they make sense at the level of the individual decision-maker? How are people likely to react to the choices provided them? Ms. Pavlich presents other perspectives on the legislation. Anticipated effects on families, future generations, the states, business, the economy, seniors and the medical profession are discussed. Each discusses the disincentives contained within the legislation from the point of view of that decision-maker. Forget the great claims coming out of Washington. These are wishful thinking and politicking of the worst kind. The reality of this legislation will be determined by the incentives and disincentives provided to individual economic actors. They will make decisions based on what is in their best interests, not the dreams of Utopian-oriented central planners in Washington. The perverse incentives provided in ObamaCare will be devastating to anything/anyone connected with healthcare. Because healthcare represents about 20% of the economy, this legislation will doom the country to economic stagnation, bankruptcy and ill health. Provide a bottom-up analysis of the incentives in play with this new legislation. Scare the hell out of you regarding the future of medical care and the country. 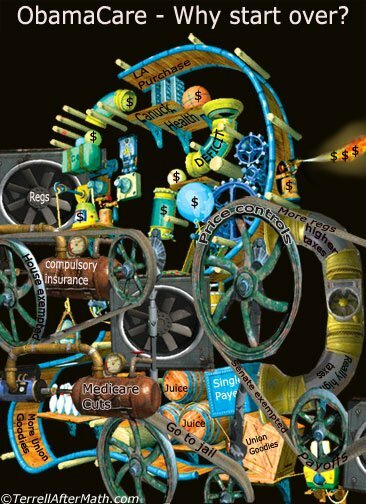 Ms. Pavlich titled her piece “The Human Costs of ObamaTax.” That likely will prove to be an understatement of the Rube Goldberg contraption imposed on the country. The same clowns who have run the Post Office, Amtrack, Fannie Mae, Freddie Mac and other programs ad nauseum into the ground are now in charge of your health. It will not go well for you, the economy or the future of the country. The penalty—now a tax—for failing to purchase insurance in 2014 is $95–for the entire year. That is far less than the monthly insurance premium even young healthy people would pay. It rises to $695 in 2016, or 2.5 percent of income, and increases with inflation thereafter. For a young person trying to afford rent and pay a student loan, the decision is clear. Delaying an insurance purchase is money in the bank, and the tax is too small to matter. The mandate is a patch, included in the ACA to try to make the individual insurance market function under ill-considered rules that will drive up premiums and drive uninsured people away from coverage. More coercion won’t solve this problem. As written, the Act makes it rational for people to drop existing insurance and pay the penalty. Should anything major happen, they can then enroll in the ObamaCare program which covers all pre-conditions. Presumably they would drop out again after the medical problem subsided, with the option to opt back in whenever another medical emergency arrives. With these incentives, there may be more uninsured under ObamaCare than before. Obviously, no insurance program can operate in this fashion. It would be akin to being able to purchase fire coverage retroactively because your home burned down. If there are any beneficiaries to the abortion known as ObamaCare, it might be Christian Scientists. Their practice of eschewing the medical system ensures they lose nothing while the rest of us are harmed. If they are subject to the penalty, then they too are losers.